This entry was posted on Tuesday, April 12th, 2016 at 2:29 pm. I received The Horse God Built from my brother-in-law, and fellow horseracing fanatic, for Christmas. If there’s one thing I love, it’s Secretariat. I reviewed William Nack’s book about him here, so I was overjoyed to read this one by Lawrence Scanlan. 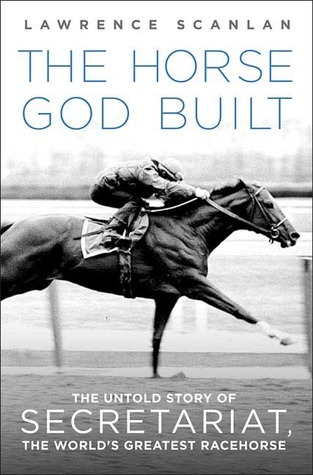 This book differs from most about the notorious Big Red because it focuses on the true unsung hero of the Secretariat story, his groom, Eddie “Shorty” Sweat. Eddie was the groom of all grooms. The groom by which other track professionals measured themselves. Scanlan does his due diligence researching this man, who was by all accounts, a humble, generous, simply charming human being. Sadly, the groom is the lowest rung on the ladder that is the racetrack, and rarely do incentives and recognition drift down that far. But none of that bothered Eddie. He was content to be among his horses, Secretariat and Riva Ridge, especially. As with most who work at the track, the love of the horse is enough to sustain them. This truly is the “untold story” of Secretariat and the person the great horse loved most, his groom. I highly recommend this book for anyone who enjoys horseracing history!